Is your teen set up to have a strong start to their school year? As parents the end of summer is bittersweet. We look forward to our teens being back on a schedule and having them out of the house, off a screen and being more productive. However, it is also the end of the relaxed evenings free from the stress of homework, papers and studying. While we as parents see the upside of having our teens go back to school, most teens dread the early mornings and the grind of the school year even if they really like school. Luckily, I have a plan that helps teens transition back to school with ease. Take a look at your teen’s clothes and shoes and make sure they haven’t grown out of their wardrobe over the summer. This might be less important if your teen’s school doesn’t have a dress code and they can continue to wear summer clothing into the fall. However, it is still a good idea to make sure your teen has something clean to wear for the first day of school. The last thing you need is a teen with nothing to wear requiring an “emergency” shopping trip the night before school starts. Most teens have plenty of school supplies like highlighters, pencils, erasers, calculators etc. that they can continue using. However, just because they had it last year doesn’t mean they have it on hand right now. Take the time to determine what they have and fill in the gaps. Buy new 1 subject notebooks and folders in five different colors. Then before school starts have your teen label their notebooks and folders by subject. For example, the yellow notebook and folder is labeled science and the blue notebook and folder is labeled math. This way your teen knows exactly which notebook to take notes in on the first day of school and where to put any handouts. Once the supplies are found or purchased, have your teen pack their backpack for the first day of school. Even if school is a couple of weeks away, it is still the best place to store the school supplies. 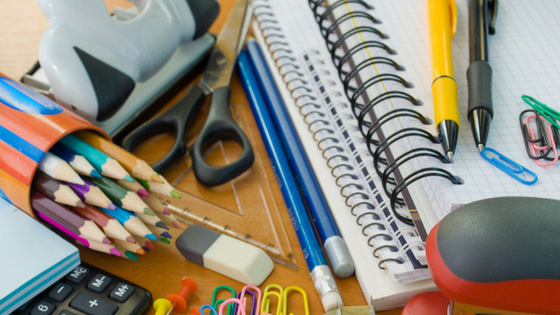 This simple step assures your teen arrives at school with the supplies they need and a plan to keep everything organized right from the beginning. This will help your teen start their school year off set up for success. If your teen is apprehensive about going back to school, and they are starting to worry about homework, grades, friends, or making sports teams, then encourage them to develop some positive mantras and repeat them while they shower. This doesn’t add anything to their To Do List, but it creates a set time for your teen to train their brain to think about what they do want versus mindlessly worrying about what they don’t want. Developing a positive mindset helps reduce stress and boosts happiness. I always do what is right rather than what is easy because every assignment is an opportunity for me to shine. People adore me and I easily attract friendships into my life that are supportive and positive. My self-worth is independent from which team I make because I know I am awesome and loved by many exactly how I am today. Most teens prefer to stay up late and sleep into the day. Depending on your teen’s summer schedule, they may or may not be way off a sleeping pattern that works for the school year. If your teen has been staying up past midnight, suggesting that they go to bed earlier probably won’t work because they will not be tired. Instead of worrying about what time they are going to bed, about a week before school starts begin waking them up earlier. This way they will at least be tired, which makes it easier to go to bed earlier once school starts. If your teen is tired enough to go to bed earlier, they will get more sleep and be able to get out of bed with a bit more ease as they transition back to a school schedule. Having an activity to look forward to right before school starts gives your teen something positive to focus on which can help reduce any back to school stress they might be experiencing. It could be as simple as having friends and family over for a barbecue. Ending summer with a fun activity is also a wonderful family tradition that builds fond memories and increases happiness. While these tips help all teens transition back to school with ease, some teens need a bit more support because going back to school throws them into The Chronic Stress Loop. If you feel like your teen would benefit from learning some strategies to help them manage their back to school stress better grab a copy of my FREE Stress Less Guide here and help your teen have a strong start to their school year.